Step 1 Place hazlenuts, cashews, cacao powder and salt into a high powered blender and pulse until roughly chopped. Step 2 Add the dates and brown rice syrup and blend until the mixture becomes a sticky crumb. Step 3 Using a tablespoon, scoop some of the mixture into your hand and begin to create a ball like shape. Step 4 Once roughly rolled, poke a hazelnut into the middle of the ball and continue to shape. Step 5 Place balls into the refrigerator to set and voila! *Keep balls refrigerated or to extend their shelf-life place them in the freezer in an airtight container. 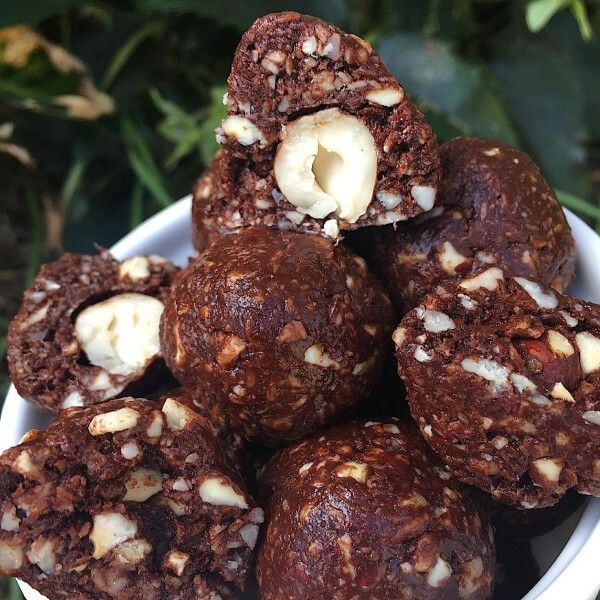 A healthy homemade version of the popular Ferrero Rocher, these little balls are the perfet sweet treat! Simple, delicious and free from gluten, grains, dairy, egg and refined sugar. Enjoy!